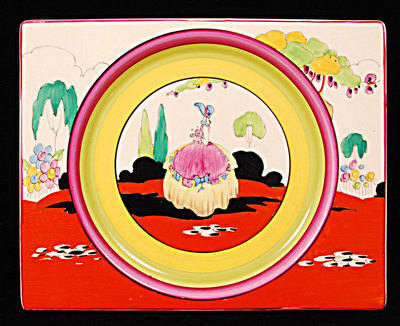 Large Plate in theBiarritzshape and Idyll pattern by Clarice Cliff. Size is 10.25 inches by 8.25 inches. Excellent paintwork. Very nicely painted with an excellent central rendition of the pattern. No restoration. Very slight bruise to the back edge. Marked TheBiarritz, Royal Staffordshire. Price £575.